She's moved and opened up her own store HERE. Make sure you bookmark it, cause she has wonderful images, and is a sweetheart, to boot!! She also has a blog to keep you up to date, and that is HERE. 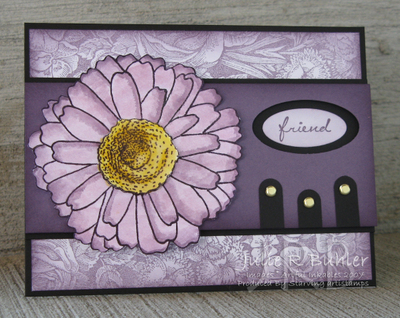 I have the friendship flowers set, and I absolutely love all the stamps in that collection. For samples of the cards I have made with these stamps, you can go to this LINK. I needed to make some thank you cards for the many families, who are giving meals to us during my recovery. I needed something that was fast and easy to reporduce, but was still elegant and eye-catching. I got it down to this, and they were super easy to make. I got this Artful Inkables flower (KSAI-102) from Kristin, the wonder woman who designs them. I cut my 8.5 X 11 white CS into 3 strips of 3 5/8 X 8 1/2. I scored them in half, and stamped the sentiment on the bottom (Warmest Regards - retired). I stamped the flower on top and colored them in 3 different color combos. The first is pretty in pink and regal rose, the second is pale and perfect plum, and the last is bashful and brilliant blue. The leaves are all mellow moss, and always artichoke. They were all colored with my SU markers. Then, to make the flower POP on each one, I edged it with barely banana. Finally, I added the matching ribbon along the top. I ended up making 4 in each color, so I will have enough to go around. 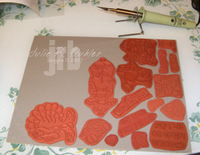 Sometimes simple is best, have fun and happy stamping!! Since I have a couple nephews that have birthday's coming up, I decided it was time to pull out my Artful Inkables stamps. 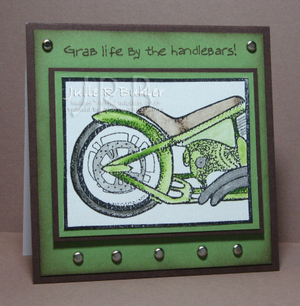 She has some awesome stamps for the guys in our lives, and here is what I made today, using the challenge today, to use the new basic grey color for one of the cards. This is one of the bikes that comes in a set of two, and I used both today. With this one, I used wild wasabi, and chocolate chip CS, as well as watercolor paper. 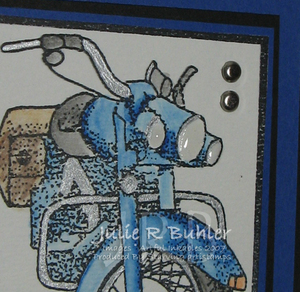 I stamped the bike with black stazon and watercolored it with my watercolor pencils and an aqua painter, using my silver gel pen for the chrome accents. I matted it on wasabi and chocolate. I inked the sentiment and did the sponging in chocolate on wasabi, and matted it on the chocolate. I then added the silver brads, using my mat pack for placement, and then added the image panel with dimensionals. I think the image should have been stamped with brown stazon instead, but that is now for another card *wink, wink*. For this one, I used the new basic grey CS and ink. I really love the charcoal look, it is dark, but not black, and is is grey, but not silvery. I stamped the bike with the new grey ink, since it is a water resistant ink. I did it on watercolor paper, since I wanted to try watercoloring with it. I used my aqua painter and watercolor pencils, and it did not bleed ONE BIT. I used the silver gel pen for te chrome on this bike, as well. I then matted it on grey, and used my photo punch on the real red CS, to make my corners. I attached them with the silver brads, and then used my cutter kit *love that little tool* to distress the edges. 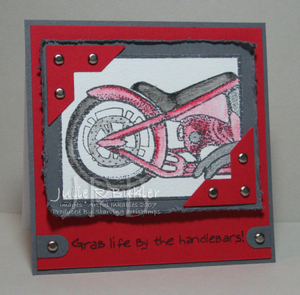 I stamped the sentiment on the red in grey, and added the word window tabs with silver brads. I then matted this onto greay, and added the image panel with dimensionals. This one used brilliant blue, and black CS, as well as the watercolor paper. 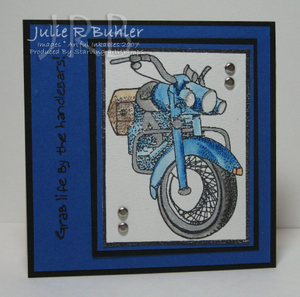 I stamped this one with black stazon, watercoloring it again with my watercolor pencils and the aqua painter. I used the silver gel pen for the chrome accents too, and then matted it on blue and black. I stamped the sentiment on the side in black on the blue and matted it on black. I matted the image panel right on the base, and then added the silver brads, using the mat pack again. To give it a little something extra, I put crystal effects in the white area which would be the lights. It gives it a cool dimension, and makes it look more realistic. I think this set ROCKS for all ages in the masculine category, from man to teen to boy!! Here is a close up of the lights, so you can see how they really look. I know the two boys that are going to receive them will be pretty excited. I really like how I made them fairly similar, yet they are so different. MY WORD, stamping means endless possibilities!! You can't beat that, have fun and happy stamping. P.S. - don't forget to enter my pay it forward post on the main page to win a gift certificate!! I absolutely LOVE this flower from Artful Inkables. When I was asked to pick some more stamps, this calla was at the top of my list. I feel it is so versatile, and is exceptionally elegant!! First, I stamped it with black stazon on white and watercolored it with my aqua painter and inks (mellow moss, and barely banana). I then added a vellum layer over it, securing it with brads. I stamped the sentiment on the top, and matted it on the black. I punched the bottom with the double rectangle and threaded my organdy through, making a knot, and cutting the loop around the back. I then attached it to the banana that I had stamped with fine lace using dimensionals. I wrapped the ribbon behind this layer and secured it with tape. I finally matted this on the black. 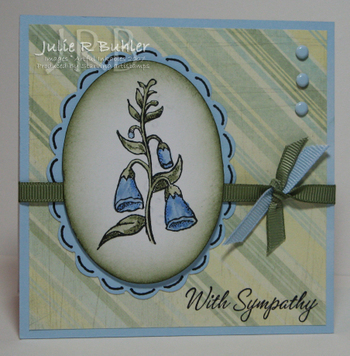 I really like how the vellum overlay gives such a softer look, especially for the occasion that this card is meant. Be safe, take care, and happy stamping!! Yep, the new In Colors are fair game for color challenges, and the two for today were soft sky and groovy guava. Love 'em both, but was totally stumped. This would explain the late posting, since I had to think on it ALL MORNING!! I do like what I came up with though, I started totally different than any card I have ever done before. All products are Stampin' Up!, unless otherwise specified. So first thing I thought was, " I wonder what the paisley BG would look stamped with guava on white?" So, I inked up my stamp with the brayer, and put it on the CS. LOVING THAT LOOK! But for me it was too much to do a whole base like that, so I cut it and matted it on the sky. I stamped the flower from Artful Inkables on my scalloped oval which I made with my small corner rounder punch(tutorial here). I watercolored it with inks and an aqua painter, sponged the edge with sky, and then put the dots in with my black marker. I matted my 2 longer pieces onto the guava, and then used the word window punch for my tabs. I glued them on and then added the black brads, to tie in the black on the image. I then matted this on the sky and added my image with dimensionals. 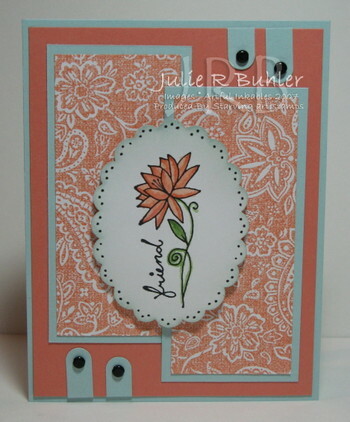 I totally love how that paisley BG stamp gives the look of patterned paper. The best part ??? You can have it in any color you want, and it will match the CS you have!! Now onto a different track completely. Did you see this post on AmyR's blog? To let you know how weird I actually am, I saw that and said - I GOTTA HAVE ONE!! So, I ordered it that afternoon from Stampin' Bella. I also got the EZmount foam, for my unmounted stamps from High Hopes(they do sell mounted, it is just cheaper this way for me). I got it today, plugged it in, and while waiting for it to heat up, I stuck all my stamps on the foam. Before I started cutting, I used Amy's lesson, and put my kids down for their naps. The "after" picture was only taken about 5 mins later than the "before" picture. Yep, 16 stamps cut out that fast!! And, I still have EZmount left for the new stamps I have coming - YAY. Am I glad that Amy sliced her leg, and told everyone about it...YOU BETCHA! Thanks girlfriend - love ya, MMMWAAA! I think I was channeling Julia Stainton when I made this card. Not that it is as good as hers, but the colors and the patterned paper, just reminds me of her. So guess what ?!? I DID NOT get a scalloped oval punch!!! 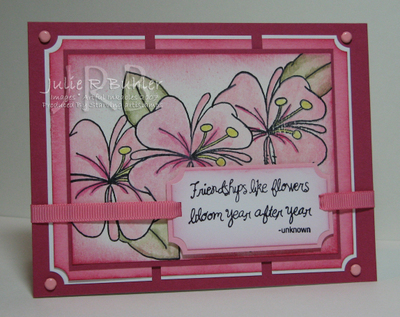 I did this using the new small corner rounder from Stampin' Up, and my tutorial here. Now how close is that to the real thing, and MUCH cheaper!! I used Stampin' Up! products unless otherwise mentioned. I used SU's bashful blue and white CS, and Memory Block 4 patterned paper from Costco. I stamped the bluebells from Artful Inkables and watercolored them with my aqua painter and inks from the lids, mellow moss, always artichoke, bashful and ballet blue. I then cut it out with the Coluzzle before sponging the edges with the previously mentioned greens. I drew with my black marker in the scallops of the oval. I matted the patterned paper on the bashful and then glued on the oval. I used the mat pack to position my brads, and then added the ribbons. I stamped the sentiment from Warmest Regards (now retired) in black and finally added the image on dimensionals. I really like how well that scalloped oval turned out, glad I waited to see how I would like the new corner rounder!! Have fun and happy stamping!! And think pretty! Pink is such a pretty color, not my fav mind you, but still pretty. Since Cambria is known as the Lady of Pink on SCS, it was natural for her to do this challenge. Since I had extra stamping time today, I decided to go at it - YAY for me. I used all Stampin' Up! products, except the images, those are Artful Inkables produced by Starving Artistamps. I totally love this flower, it brings me back to my time in Hawaii, the shortest 3 months of my life. I used rose red, pretty in pink, white CS and watercolor paper for this challenge. 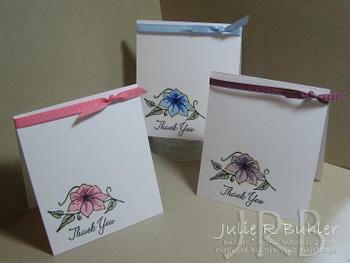 I stamped the middle flower, and then masked it to get the other flowers and the leaves. I used black Stazon, so I could watercolor, using my watercolor wonder crayons and an aqua painter. I used the same crayons as the CS, adding celery and artichoke for the leaves, saffron for the stamen. I sponged the edge in rose and used my color spritzer and the pink marker to add a bit more color in the whiter areas. I then matted it on the rose CS. I sponged the pink CS with rose, punched the corners, and then matted it on the white, which I had punched, too, with the ticket corner punch. This was then cut into 3 and matted onto the rose base. I added the pink brads from the soft subtles collection, and then put my image on top. I stamped the sentiment from the same collection in black, sponging the edges in rose before puching those corners with the ticket corner. I matted it on the pink, which had been punched, and then used my double rectangle to get the slots for the regal ribbon to go through. This was added with dimensionals, and the ribbon attached to the back. I hope you like my Think Pink card, have fun and happy stamping!! For the Featured Stamper challenge today, I decided to try and pair my Stampin' Up! products with the new Artful Inkables stamps that I received. I think they go beautifully together. I used white, black and perfect plum CS. This is the card of Ana's that I CASEd. 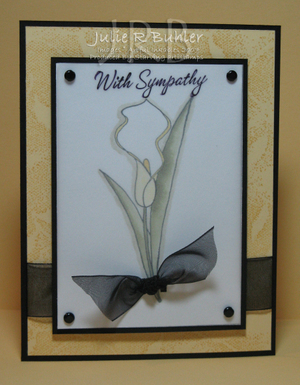 I stamped the flower in stazon black twice on white CS. I watercolored one with pale and perfect plum inks, and the center with summer sun. I cut it out, including some petals for dimension, and then colored the center of the other flower with the summer sun. I cut it out and layered it on top with dimensionals to give it a fuller feel. I stamped the floral BG on white in perfect plum, and sponged the edges in the same color before matting it on the black. I sponged the plum CS panel with the same ink, and made the tabs by using the word window punch. I punched through with the large oval on the plum, stamping the sentiment in plum on the white, punching with the small oval and sponging this as well. I attached the tabs with gold brads, and then added the whole panel onto the black with dimensionals. I then glued the sentiment in the oval frame, and then glued on the flower. I really like how this turned out, that flower really POPS with the size, and all the awesome petals. I am really having fun here, you should try them out!! Have fun and happy shopping ... ummmm stamping ... hehehe. Sooooo, here is my OTHER big news from this post. I was asked to design for Artful Inkables!! These are stamps produced by Starving Artistamps. Yep, still pumped ... hehehe. OK a little review...I love the images, the ones I have are very detailed, and deeply etched on red rubber. The bonus for me, is that they already came on EZ cling, so I did not have to do all of that, but you can also get them mounted. They were cut very close to the image, and to me that is very important. I HATE getting lines beside my image while I am stamping, and there is not chance of that with these stamps. 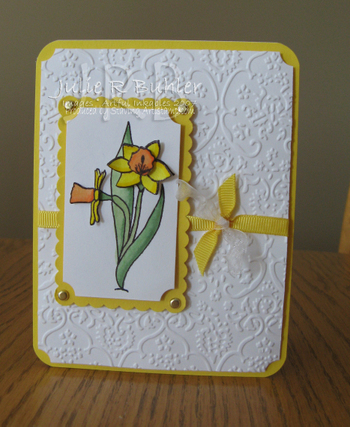 Now to the card...I used her daffodil image. As soon as I saw it, I knew I wanted to do paper tole. I stamped the image 3 different times. I watercolored the flowers with yoyo yellow and only orange, and the stems and leaves with garden green and wild wassabi, All Stampin' Up!. I then cut out the petals from both flowers and used a dimensional to attach them. Then I cut out just the trumpet area on the big flower and used another dimensional to mount it. I punched my scallop square punch twice in yoyo, gluing them together to get my rectangle. I notched the white corners with the ticket corner punch, before putting it onto my rectangle with dimensionals. I then put gold brads in the corners using the 1/16 punch to get my holes. I ran the white layer through the Cuttlebug with my textile embossing folder. I also used my ticket corner punch on this layer. I then wrapped the SU yellow ribbon around it an tied it together with a piece of white SU organdy. I then heat curled the ribbon before adding the image panel on dimensionals. I used the corner rounder punch on the yoyo base, and then used more dimensionals to added the rest of the card. I really like this card, it is so cheery with these colors. I did leave it sentiment free, so I caould use it for any occasion. Go ----------> check out these stamps, I can hardly wait to play again. Have fun and happy stamping! !